When the power mode is in ON, you can use the brightness control knob to adjust instrument panel brightness. Brighten: Turn the knob to the right. Dim: Turn the knob to the left. You will hear a beep when the brightness reaches minimum or maximum. The multiinformation display will return to its original state several seconds after you adjust the brightness. If the wiper stops operating due to any obstacle such as the build-up of snow, park the vehicle in a safe place. 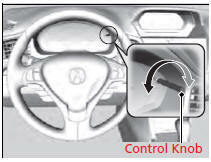 Rotate the wiper switch to OFF, and set the power mode to ACCESSORY or VEHICLE OFF (LOCK), then remove the obstacle. Instrument panel brightness varies, depending on whether the exterior lights are on or off. The instrument panel dims to reduce glare when they are on. When it is bright outside and the headlight integration with the wiper is activated, the instrument panel brightness does not change. Pressing the SEL/RESET button or either (information) button switches the display. If you turn the knob to the right until the brightness display is up to max, the beeper sounds. This cancels the reduced instrument panel brightness when the parking lights are on. The brightness can be set differently for when the exterior lights are on, and when they are off.